Painted the first miniature in half a year a few weeks ago, and thought I should share. That’s what blogs are for, right? It’s a model for the Oldhammer forums annual legacy warband. This year the theme was space pirates, and the only colour restriction was to use turquoise as a splash colour somewhere. As the deadline drew close, I opted out and figured I wouldn’t participate, but in the end I picked up one of the many primed but unpainted models kicking about in my cabinet. I quite like the model, even if it’s a chunky plastic one, and was a bit sad to send it off. Would’ve liked to keep it, really. The gritty chunks at his feet are remains of the original base I had mounted him on. I cleaned it up more before sending it off to Axiom, who’s organizing the whole thing, but forgot to take new photos. The model comes from Wizards of the Coast’s prepainted Star Wars miniatures range. It’s a Human Blaster-For-Hire from the Bounty Hunters set. 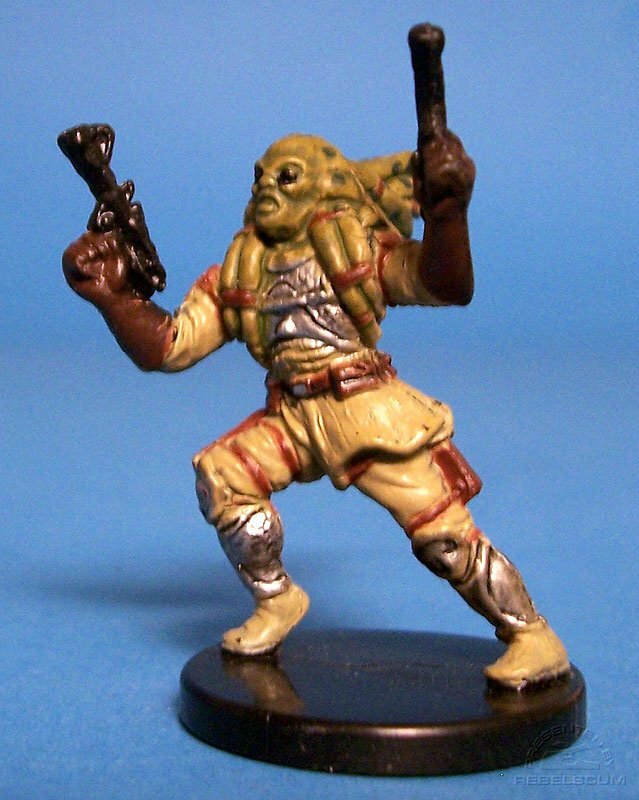 I always felt he looked like he was from the budget end of the spectrum, as far as blasters-for-hire go. Maybe an unexperienced local kid, who is set up to try and collect his first bounty but instead of pushing on and getting blasted to smithereens (alas, poor Greedo) he changes sides and join forces with the heroes of the story, finding a purpose in fighting the good fight. Here’s how the guy looked to begin with. Not very exciting, but a pretty servicable paint job. For some reason I’m on a Star Wars trip now. Can’t fathom why… More Star Wars soon! This guy have been primed on the table since the day I decided to do a small scifi project. 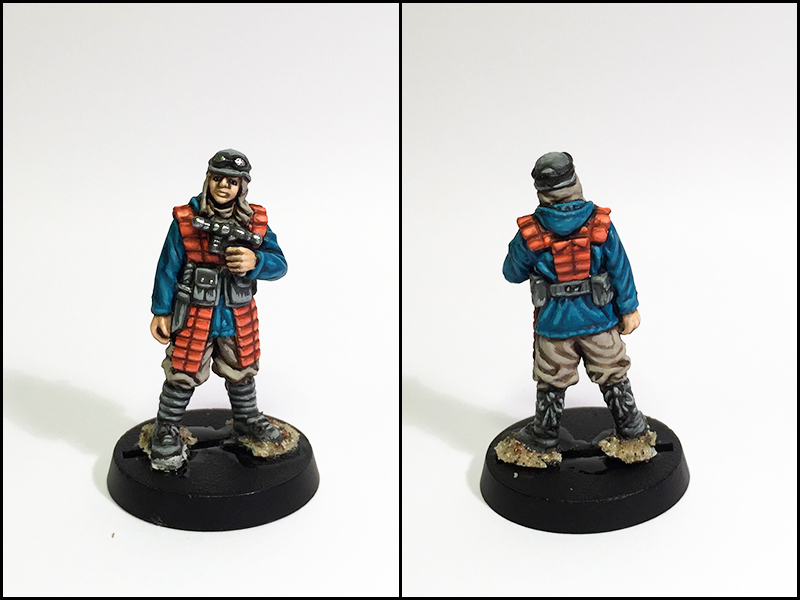 Thanks to the Scifi Painting Club over at the Lead Adventure forums I finally picked him up for a quick paintjob. 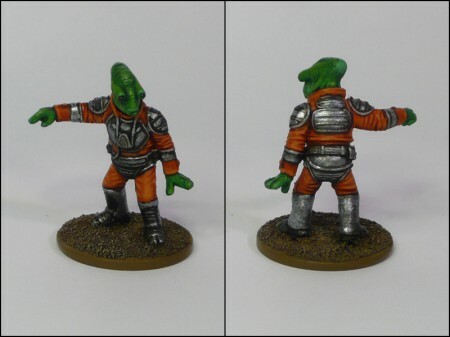 Born and raised in the irradiated first terraforming colonies of McKemmler IV, Mortie is one of few native mutants to actually get out of the system. Now he’s returned to his old home planet to recruit his old hoodlum friends as crew aboard his newly acquired freighter ship. Nicknamed “Balls” by his crew for being a daring fighter and captain. 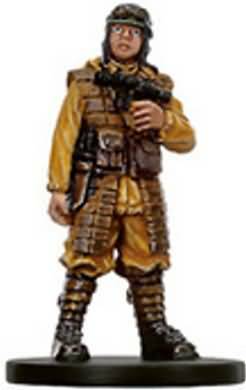 The model is a bendy pre-paint from WOTC’s Star Wars Minis range; Nautolan Soldier. I always thought they’d look fun painted as a human mutant. 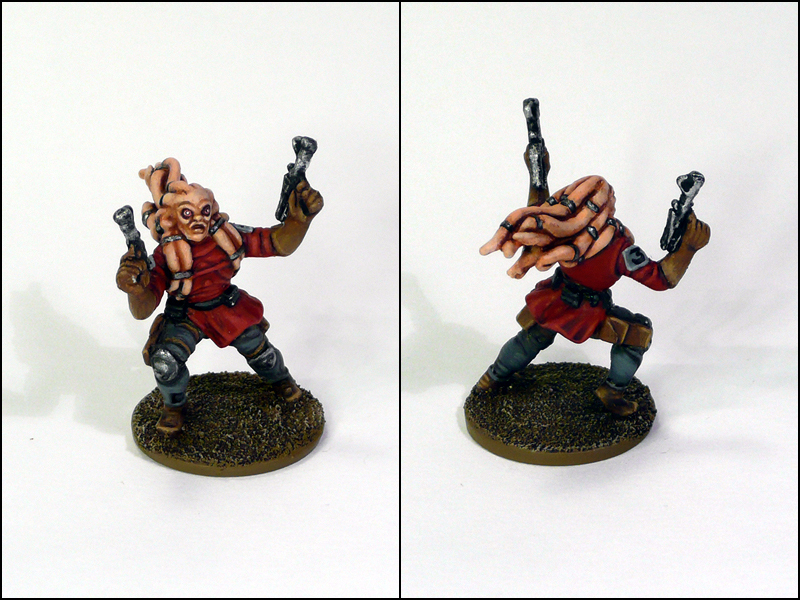 It was a bit soft in the details, as expected – and I have to say I completely failed on those pistols. 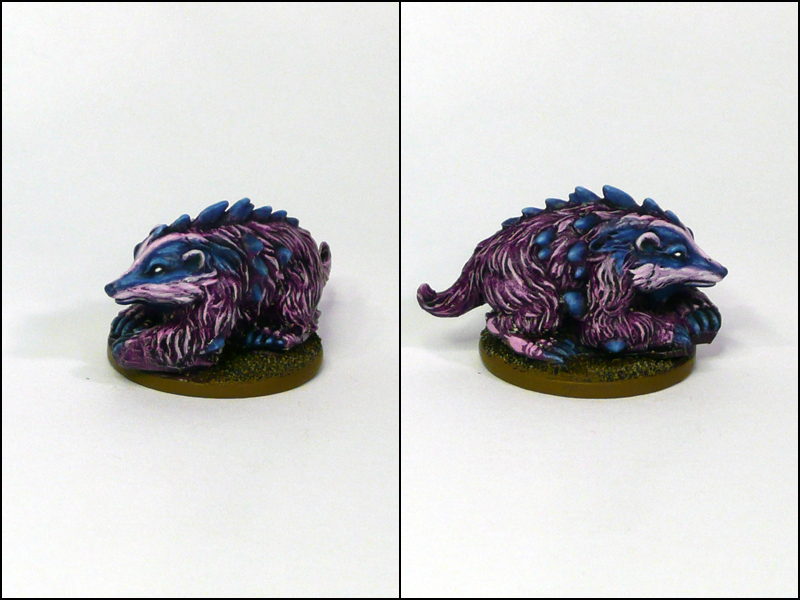 Oh well, he’s for gaming and will work just fine on the table. At first, I did his eyes regular “white with a black dot” – and while it really underlined the bugeyed style of him, it felt a bit dull. So I gave the eyes a red wash, which made it a lot better but all of a sudden the contrast was gone so for some reason he got a white dot in the middle of his pupil instead. Almost makes him look too alien for my taste. If I would do such eyes again I would paint the socket black, eyeball white, wash with red, thinned white on the centre of the eyeballs and finish off with a little black pupil in that white centre. Original unpainted version, courtesy of the internet. Lately, I’ve been reading Five Parsecs From Home, which looks rather promising. 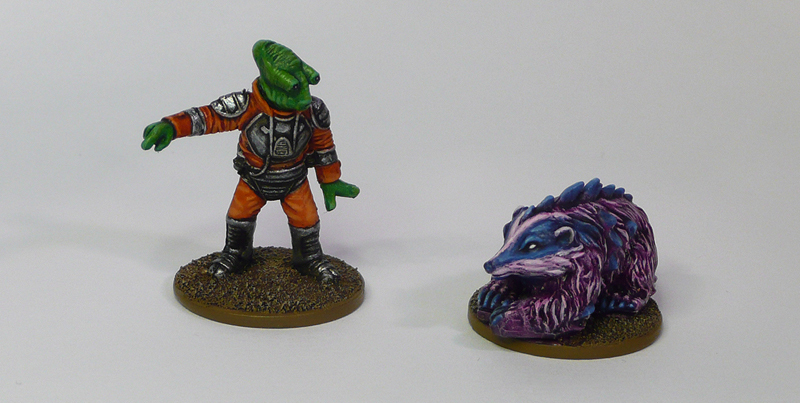 Five Core is the actual ruleset while Five Parsecs is a campaign add-on for playing murder hobos in spaaaace. I hope I’ll be able to get a game or two in during the long Christmas holidays. In other news, Gareth over at Drums in the Deep have released his dungeon crawling rules Trapdoor (formerly known as Cavern Crawl)! Go check it out, it’s a great rule set for pseudo RPG dungeon crawling.